Our Annual Summer Sale is almost here! From Wednesday, June 20, 2012, until Tuesday, July 31, 2012, all of our full-size and refill-kit-size minerals will be on sale at 20% off. This sale runs for such an extended amount of time as we want to make sure that everyone has a chance to order samples, test them out and still have enough time to order full-size jars or refill kits. Please make sure to stock up on your favorite Buff'd mineral products as once the sale is over our next sale is not until November 2012! We have also just added a new Foundation Shade Help page which gives some great tricks on how to determine your correct undertone. 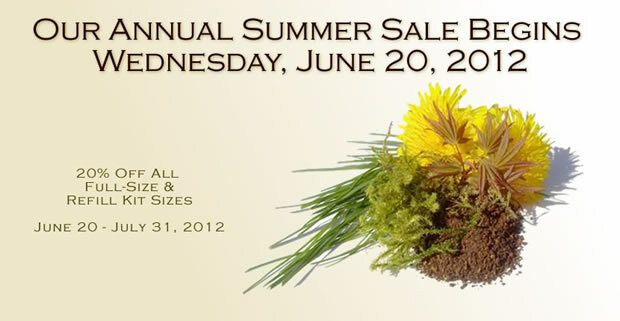 Sale ends midnight Tuesday, July 31, 2012. Now in a Lip Gloss - Orchid! One of our most popular lipstick shades is now available in a lip gloss! Orchid is a deep pink shade with rich red undertones. It is our first lip gloss which is more of a full color shade with almost no shimmer. It works great as a top coat over any of our lipstick shades or is simply wonderful by itself. We have added three new foundation shades to our line up. First, we have finally added Cool - Medium and Cool - Medium Tan shades to our collection! These will be the final two shades which complete our Cool undertone line. We have also added an Olive - Fair 2 shade. Very similar in depth and darkness to our original Olive - Fair shade, our Olive - Fair 2 shade has significantly reduced golden yellow undertones. Samples of all three of these shades in all three formulations are now available for order. We have added several fantastic new brushes to our Brown Faux Brush Collection. The Small Rounded Face and Large Rounded Face brushes are both great for expert blush and bronzer application. For perfect touch ups on the go both the Mini Flat Top and the Retractable Kabuki are perfect for throwing in your purse or travel bag. Looking for an entire set to take on the go? We now have a 7 piece mini travel set with all the essentials and it comes in its own chic black nylon case! Try our brand new Tra La La Velvet Matte Blush. A flirty warm pink shade perfect for the summer months... beautifully soft and completely matte. Hot Color - Cool Price! Special pricing on both the full and refill kit size!